This briefing note describes the overall process from receipt of initial enquiry through to installation of the strengthening system. This information, along with any other relevant engineering details, is sent to Cintec™ for costing. The design is then proposed to the Client for consideration. Once a contract has been awarded a detailed survey of the bridge is required. 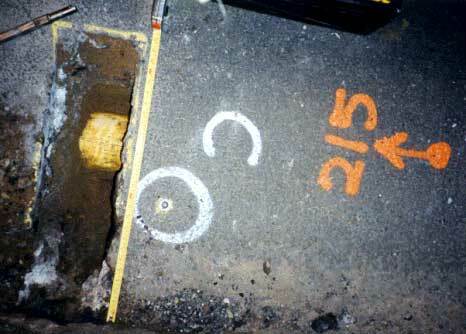 A total station survey of the whole bridge is undertaken, paying particular attention to the road and barrel surfaces. In addition, Control Points are established that are used for the setting out of the drilling rig during the works. These points are positioned in the road surface when installation is from above and in the barrel intrados surface when installation is from below. During the survey a visual inspection is also carried out to determine the general condition of the bridge and to note any specific defects that may influence the design. Where necessary, locations of defects such as cracks will be included in the survey. If the barrel thickness has not been determined previously, or if there is any reason to doubt the information already available, then it may be necessary to arrange for core samples to be taken. Other internal investigations may be necessary for example; to determine whether backing exists; establish the thickness of concrete saddles and also to locate underground services. Using the data from the survey a 3-dimensional CAD model is generated, including the road and barrel surfaces and Control Points. Anchors are positioned in the model as required and the intersections of the holes with the road determined to define the setting out locations for drilling (Figure 3.1). Dimensions from the Control Points, vertical angles and horizontal angles, are calculated to describe the holes that have to be drilled precisely. The detailed calculations for the Archtec design are carried out using the program ELFEN that uses the Discrete Element technique. The discrete element technique is well suited to simulation of non-homogenised continuum such as masonry, concrete and soil. By representing separate parts that can deform and interact with each other highly dynamic and non-linear systems both in 2D and 3D can be modelled more simply at a fundamental level. Many thousands of parts can be represented each with prescribed friction/contact laws at their boundaries. The capability to evolve further parts by fracturing into separate fragments is also possible by using limiting tension non-linear material models and advanced mesh adaptivity schemes. Efficient solvers based on explicit dynamic algorithms enable many classes of problem to be solved that would be near impossible by conventional analysis. Initially the existing structure is analysed without any anchors, and it is sometimes possible that sufficient additional strength can be justified on the basis of the advanced analysis and that the need for strengthening can be avoided. Assuming, however, that the structure fails then the arrangement of anchors will be included in the model and the structure assessed at Ultimate Limit State for the required loading. This is normally done for 40 tonne single, double and triple axles but other live load ratings can be considered. 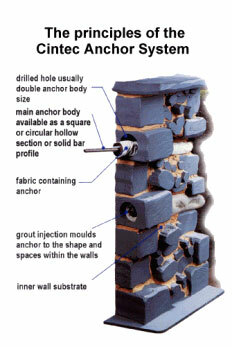 Stresses in the masonry are examined and the axial loads and bond stresses in the anchors checked. 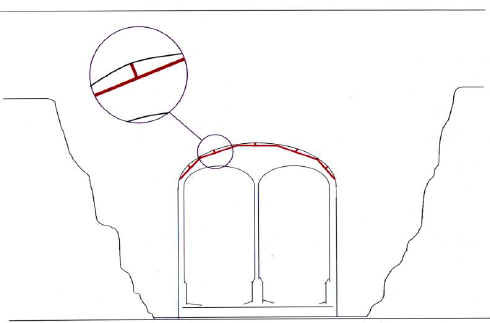 The analysis is also carried out at Serviceability Limit State to check that no permanent damage has occurred (eg deformation of the arch barrel or slipping of the anchors). Calculations summarising the parameters used in the analysis and the results obtained can be provided for the client if required. A General Arrangement drawing and a Setting Out drawing are produced providing the details of the anchor arrangement. The General Arrangement shows the approximate dimensions of the bridge and the positions of the anchors in plan and elevation. The Setting Out drawing contains the details of the Setting Out Points and their distances from the Control Points. It also lists the final anchor and hole lengths with their respective angles of installation. If remedial measures are required in addition to the Archtec system then they may be included on the General Arrangement drawing or on separate drawings. The strengthening method relies on very precise alignment of the holes drilled into the structure. The accuracy of the angle and position are crucial as the hole can be as little as 30mm away from the arch soffit at the tangent location. Close cooperation between Gifford and Partners and the drilling contractors has been necessary to develop the appropriate setting out and work procedures in order to achieve the required standards, and only a small number of approved contractors are used for the work. At the beginning of the contract phase the drilling contractors have to mark out the Setting Out Points and locate any services in the bridge that may clash with the anchor installation (Figure 6.1). A representative from the engineers or Cintec™ assists with this process and liaises with the designers should adjustments to the design be necessary. With the drilling points defined and services exposed, the drilling contractor can set up the drilling rig on the road surface touching the road at the defined point of contact (Setting Out Point). The rig is bolted to the road through the tarmac to prevent movement during drilling. The vertical angle, as defined on the Setting Out Drawing, is set and drilling commences (Figure 6.2). During drilling the angle is checked on several occasions to ensure that the drilling rig has not deviated. The accuracy of the angle and position are crucial as the hole can be as little as 30mm away from the arch soffit at the tangent location. Once the hole is drilled, the anchor and sock is inserted into the hole (Figures 6.3 and 6.4). and the drilling rig can then be moved to begin the next hole. The grout is injected through the grout tubes to the bottom of the sock, which inflates from the bottom up thus preventing air from becoming trapped. The grout pressure expands the sock to fill the hole, providing a bond between the grout and masonry but not allowing the grout to leak through the masonry. A model of the Cintec™ anchor is shown in Figure 6.5. As the grout cures the anchor/grout/masonry bond is completed and the road surface can then be made good. This process is repeated for all the holes detailed on the construction drawings. Using the measurements stated in the location plan, measure from the survey control points, using at least three different points, where the measurements cross install a masonry nail in the road surface. Always double-check the measurements and the crossing points before starting the next stage. Fit core bit into drilling rig and adjust the drill rig stand to the drilling angle, stated in the location plan. Position the rig over the marker nail with the back of the core bit touching the nail. Adjust the rig to the required angle, re-check entry point, and secure the rig to the road surface. 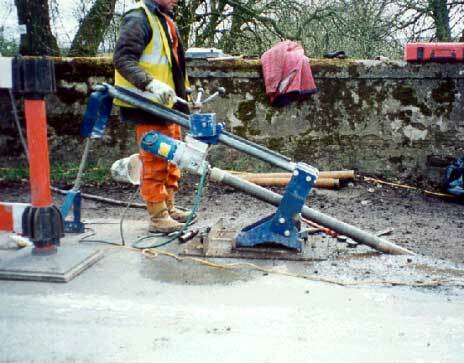 If possible check the angle and direction of the drill on the external face of the bridge using a string line. The bore hole must be within 20-40mm of the outer ring. Re-check angle and commence drilling. After drilling about 100mm stop and recheck angle if it is still correct drilling may proceed to the required depth. Re-check angle and commence drilling. After about 100mm stop and recheck angle. If it is still correct drilling may proceed to the required depth. After drilling remove all cores from the hole and check depth. If mining barrels were used to drill the hole the barrels can be re-inserted and the anchor installed through the barrel. If not a suitable sleeve must be used to line the hole and the anchor installed through this. The grout is packed in 25 kg (56 lbs) bags and is mixed with clean cold water. The normal mixing ratio is 5.5 litres (1.45 US Gal) of water to one 25 kg (56 lbs) bag of grout. One 25 kg (56 lbs) bag will yield 14.6 litres (3.86 US Gal) of fluid grout when mixed. The 5.5 litres (1.45 US Gal) of water can be increased by up to 10% (550 ml OR 0.13 US Gal [1 pint]) in hot weather (20°C or 68°F) or when the substrate is very dry / porous or the injection process is through very small injection tubes. Do not increase the water content outside of these parameters, as this will weaken the strength of the set grout. Place 5 litres (1.32 US Gal) of clean/cold water into a clean mixing bucket and slowly add approx. 3/4 of one bag of Presstec grout while mixing. Add a further 0.5 litre (1 pint) of water (to make up the required 5.5 litres/1.45 US Gal) and the remaining grout. Continually mix the grout for 4 minutes removing all the dry mixture from the sides of the bucket. Allow the mixture to stand for 5 minutes, during which the mixture will start to thicken; the amount the mixture thickens will depend on the ambient temperature and the temperature of the dry grout and water. At this stage some or all of the 10% extra water may be added to achieve a smooth creamy texture with no peaks forming on the surface and no surface water is visible. Pour the mixed grout into the pressure pot through the sieve. Pressurise the pot from 3 bar to 5 bar (40-72 psi) dependent on the type and length of anchor being installed. Cut the plastic mastic nozzle to fit over the injection tube. Test the grout flow into a suitable bucket. 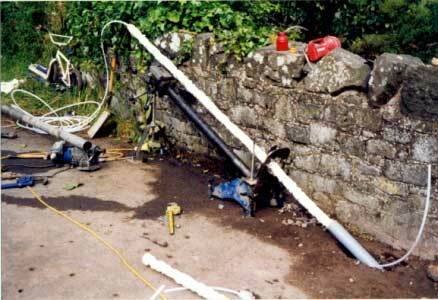 If the grout flow is continuous and of sufficient pressure, the anchor can be injected. Turn on the control valve and the grout will flow to the rear of the anchor and inflate the sock along the length of the anchor to the front. When the anchor is nearly full, stop injecting for 1 minute and start again for 30 seconds continue doing this until the anchor is full. This injection method allows the pressure in the sock to dissipate, between injection periods, and reduces the risk of spalling or displacement of the brickwork. 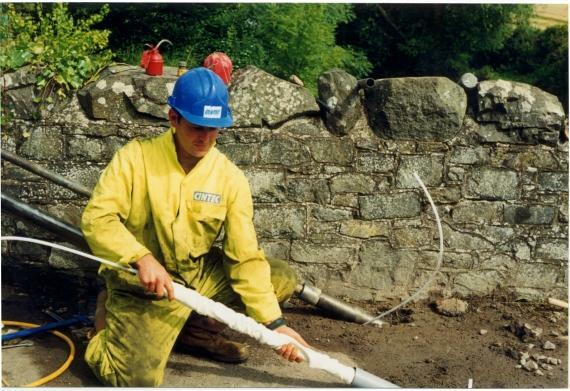 In particular cases, especially when working in friable material, the anchor is to be inflated at low pressure (normally not exceeding 3 bar) and in sections utilising extra grout feed tubes. Please note that the anchor is not fully inflated until the grout milk has stopped flowing through the sock. Pressure must be maintained to allow this to be achieved. With large injection orifices a suitable plug must be placed in the injection port immediately after removing the nozzle. From underneath the bridge, using the measurements stated in the location plan, measure from the survey control points, using at least three different points. where the measurements cross install a masonry nail in the barrel surface. Always double-check the measurements and the crossing points before starting the next stage. Fit core bit into drilling rig and adjust the drill rig stand to the drilling angle, stated in the location plan. Position the rig over the marker nail with the top of the core bit touching the nail. Adjust the rig to the required angle, re-check entry point, and secure the rig to the barrel surface. If the angle makes rig drilling impossible the holes can be drilled using a hand held drill. Double check the angle, where possible. using a string line on the outside edge of the bridge. Check the angle and direction of the drill several times during the drilling operation. After drilling remove all cores and debris from the hole and check depth. Unpack the anchors and check the fabric sock for any damage in transit. Insert the anchor in the bore-hole to the depth specified. The 5.5 litres (1.45 US Gal) of water can be increased by up to 10% (550 ml or 0.13 US Gal [1 pint]) in hot weather (20°C or 68°F) or when the substrate is very dry/porous or the injection process is through very small injection tubes. Add a further 0.5 Iitre (1 pint) of water (to make up the required 5.5 litres/1.45 US Gal) and the remaining grout. Allow the mixture to stand for 5 minutes, during which the mixture will start to thicken; the amount the mixture thickens will depend on the ambient temperature and the temperature of the dry grout and water. At this stage some or all of the 10% extra water may be added to achieve a smooth creamy texture with no peaks forming on the surface and no surface water is visible. Pour the mixed grout into the pressure pot through the sieve. Pressurise the pot from 3 bar to 5 bar (40-72 psi) dependent on the type and length of anchor being installed. Cut the plastic mastic nozzle to fit over the injection tube. Test the grout flow into a suitable bucket. If the grout flow is continuous and of sufficient pressure, the anchor can be injected. Starting with the lower anchor turn on the control valve and the grout will flow to the rear of the anchor and inflate the sock along the length of the anchor to the front. When the anchor is nearly full stop injecting for 1 minute and start again for 30 seconds continue doing this until the anchor is full. Repeat the procedure for the top anchor. This injection method allows the pressure in the sock to dissipate, between injection periods, and reduces the risk of spalling or displacement of the brickwork. 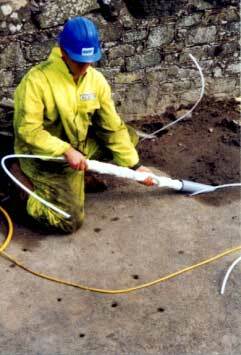 In particular cases, especially when working in friable material, the anchor is to be inflated at low pressure (normally not exceeding 3 bar) and in sections utilising extra grout feed tubes. Clean brickwork immediately after grout injection. The following photographs show the protection system that was used on a previous project and the diagram illustrates the principle. Netting (normally Fortrac), small enough to prevent any tiny fragments falling to the line but strong enough to secure any larger particles, is fixed to the surface of the arch by battening secured by screws into the arch soffit.